Where the Torah tells about the creation of the first human being, the most prominent Jewish commentator, Rashi, explains that the earth from which Adam was formed was not taken from one spot but from various parts of the globe. Thus human dignity does not depend on the place of one's birth nor is it limited to one region. The greatness or worth of a person is not measured by his or her outward appearance. Jews believe that Adam was created in G-d's image and that he is the common ancestor of all mankind. At this stage in human history, there is no room for privileged people who can do with others as they please. Human life is sacred and human rights are not to be denied by those who would subvert them for "national security" or for any other reason. No one knows this better than the Jews, who have been second-class citizens so often and for so long. Zionists, however, may differ. This is understandable because Judaism and Zionism are by no means the same. Indeed they are incompatible and irreconcilable: If one is a good Jew, one cannot be a Zionist; if one is a Zionist, one cannot be a good Jew. A conference such as this is long overdue, and I wish to thank those who made it possible to hold it. For over 60 years I have fought Zionism, as did my father before me, and I am therefore quite familiar with it. For those who have been in this fight for only the last ten or twenty years, what I have to say may be surprising or even shocking. 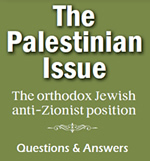 Nevertheless these matters must be stated clearly and openly, because unless the disease of Zionism is diagnosed accurately, it cannot be cured. Too long have those opposed to Zionism engaged in daydreaming and wishful thinking. In order to recognize Zionism for what it is, one has to know about Judaism, about Zionism -- the opposite and negation of Judaism, and about Jewish history. In the time allotted to me, I am not going to talk about the actions of the Zionists; they will be adequately dealt with by other speakers. As a Jew, I plan to discuss Zionism, which is rebellion against G-d and treason to the Jewish people. To begin with, a few definitions: Who is a Jew? A Jew is anyone who has a Jewish mother or who converted to Judaism in conformity with Halacha, Jewish religious law. This definition alone excludes racism. Judaism does not seek converts, but those who do convert are accepted on a basis of equality. Let us see how far this goes. Some of the most eminent and respected rabbis were converts to Judaism. Jewish parents throughout the world bless their children every Sabbath and holiday eve, and they have done it in the same way for millennia. If the children are girls, the blessing is, "May G-d let you be like Sarah, Rebecca, Rachel and Leah." Not one of these matriarchs was born a Jewess; they were all converts to Judaism. If the children are boys, the blessing is, "May G-d let you be like Ephraim and Manasseh." The mother of these two was an Egyptian woman who became Jewish and had married Joseph. Moses himself, the greatest Jew who ever lived, married a Midianite woman who became Jewish. Finally, the Tanach, the holy writings of the Jew, contains the book of Ruth. This woman was not only not Jewish by birth, but she came from the Moabites, traditional enemies of the Jewish people. This book describes Ruth's conversion to Judaism and is read annually on the holiday commemorating the giving of the Torah, the "Law," i.e. the Pentateuch. At its very end, the book of Ruth traces the ancestry of King David, the greatest king the Jews ever had, to Ruth, his great-grandmother. Apart from the Zionists, the only ones who consistently considered the Jews a race were the Nazis. And they only served to prove the stupidity and irrationality of racism. There was no way to prove racially whether a Mrs. Muller or a Mr. Meyer were Jews or Aryans. The only way to decide whether a person was Jewish was to trace the religious affiliation of the parents or grandparents. So much for the this racial nonsense. According to Jewish tradition, there are seven Noahide laws which apply to all human beings. Then there are the Ten Commandments which form basic standard of morality and conduct for adherents of all monotheistic religions. In addition to these, there are 613 laws obligatory for Jews, and every Jew has to observe those which are applicable to him or her according to Halacha. It is the carrying out of these mitzvoth, "commandments," which constitutes the essence of being Jewish, and therefore of the Jewish people and their covenant with G-d. The greatest leader of the Neturei Karta was Rabbi Amram Blau, an inspired and dedicated leader whose compassion equaled his courage. He could not keep silent in the face of injustice, immorality, or hypocrisy. He was beloved by Jews and respected by Christians and Muslims. Born in Jerusalem, he never left the Holy Land during his entire life. In his writings he stressed many times that Jews and Arabs had lived in harmony until the advent of political Zionism. Rabbi Blau was imprisoned in Jerusalem, not by the Ottoman authorities, not by the British, and not by the Arabs, but by the Zionists. What was his crime? He defended with vigor and honesty, without regard for his own safety, the holy character of Jerusalem against the "innovations" and encroachments of the Zionists. He fought for the sanctity of the Sabbath and actively opposed the inroads of indecency and immorality made under the Zionist regime. Unceasingly Rabbi Blau denounced the establishment of a Jewish state before the coming of the Messiah as an act of infamy and blasphemy. Under his leadership, the Neturei Karta declared year after year that they did not recognize the legitimacy of the Zionist state or the validity of its laws. Nothing could be further from the true ideals of the Jewish people. The Jewish people were chosen in the first place "for you are the leas of all nations." As the Psalm says, "they rely on vehicles and horsepower, but we invoke the name of the Eternal, our G-d."
It is not my purpose to detail how Zionism should be dealt with. Let me state, however, that isolated or spontaneous acts against individuals or the mere adoption of resolutions in the UN or elsewhere are not effective means of bringing an end to Zionism. Let me state also that the battle against Zionism must be waged first, not on the shores of the Mediterranean, but in Zionism's most powerful bastion the USA. As an American citizen, I deplore that our government and our politicians have adopted an attitude that is in complete contradiction to the advice of the father of our country George Washington. Instead of shying away from foreign entanglements and permanent alliances with foreign powers, the establishment in Washington has embraced Zionism so wholeheartedly that in the eyes any criticism of the Zionist state and any opposition to political Zionism in the UN by any nation has become a punishable offense. And the American media do not dare to speak out against such an absurdity. Let us take faith and hope in the certainty that eventually prejudice, hatred, and injustice will disappear, and that the prophecy will come true that all nations of the world will participate in the pilgrimage to Jerusalem, "For My house shall be called a house of prayer for all nations."